This post was written by Louise To, Professional Development intern in the Smithsonian Libraries’ Education Department. Interesting in interning with our Education Department? Apply for a virtual opportunity before July 26th. Hi. I’m Louise. I’m currently completing a dual-degree Master’s program in Learning Design and Technology (M.Ed.) and Library and Information Sciences (MLIS) at the University of Hawai‘i at Mānoa. I was born and raised in Honolulu, Hawai‘i. 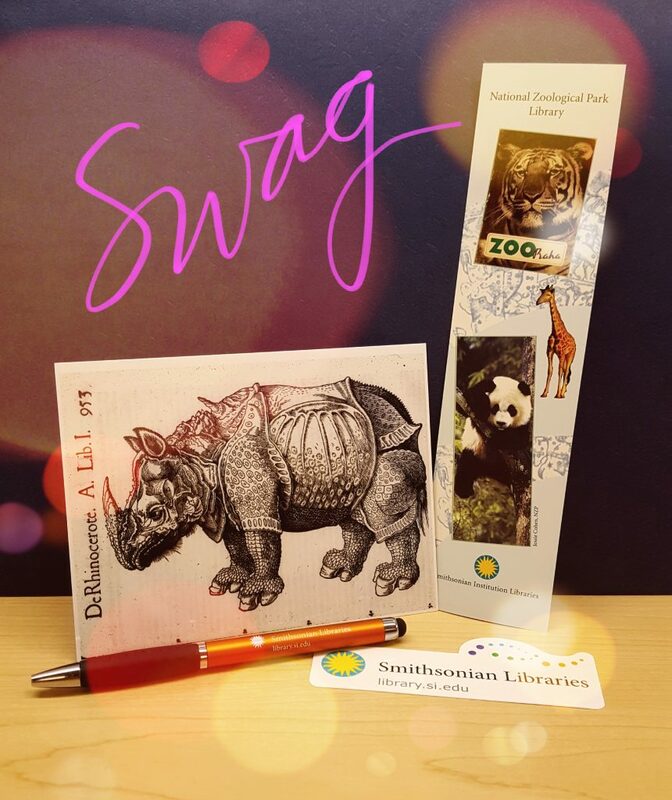 Some Smithsonian Libraries goodies given to participating teachers. I See Wonder is an online educational resource created to inspire intrinsic motivation and visual literacy practice among K-12 students through the Smithsonian Libraries’ digital collection. The initial evaluation of I See Wonder began in March of 2017, once the resource had been available to teachers for a few months. A previous educationa intern conducted and transcribed the first 13 interviews. During that time, a consultant was hired to analyze the data and create a report for the Libraries’ Education Specialist, Sara Cardello. During my internship this summer, I concluded the evaluation. To begin, I created a mid-evaluation plan to orient myself to how the goals of I See Wonder align with the Libraries’ mission and vision. In addition, the evaluation plan helped pinpoint where I had landed in the evaluation process, and helped me differentiate the goals of the evaluation and the goals of the resource. For example, while the resource, I See Wonder, ultimately aspires to promote learning, the I See Wonder evaluation aspires to learn how K-12 teachers integrated the resource into their curriculum. This particular evaluation of I See Wonder was not focused on finding out whether students had learned from the I See Wonder collections. That would need to be a separate assessment, and/or conducted alongside the evaluation from the beginning. Finally, the plan gave me the space to conduct a literature review and create a timeline in anticipation for the Education committee’s quarterly Board meeting. There, the Education Specialist would be presenting the evaluation findings. Since most K-12 teachers were basically at the end of their school years, we struggled to recruit teachers to interview. I figured some kind of incentive may encourage teachers to speak with us. We informed teachers that we would send them some Smithsonian Libraries’ swag in the form of stickers, postcards, and bookmarks that they could hand out to their students, in hopes of recruiting more teachers. In the end, I interviewed 11 more teachers over the course of six weeks. After transcribing and analyzing those interviews, I combined the findings with the previous written report produced by the consultant. 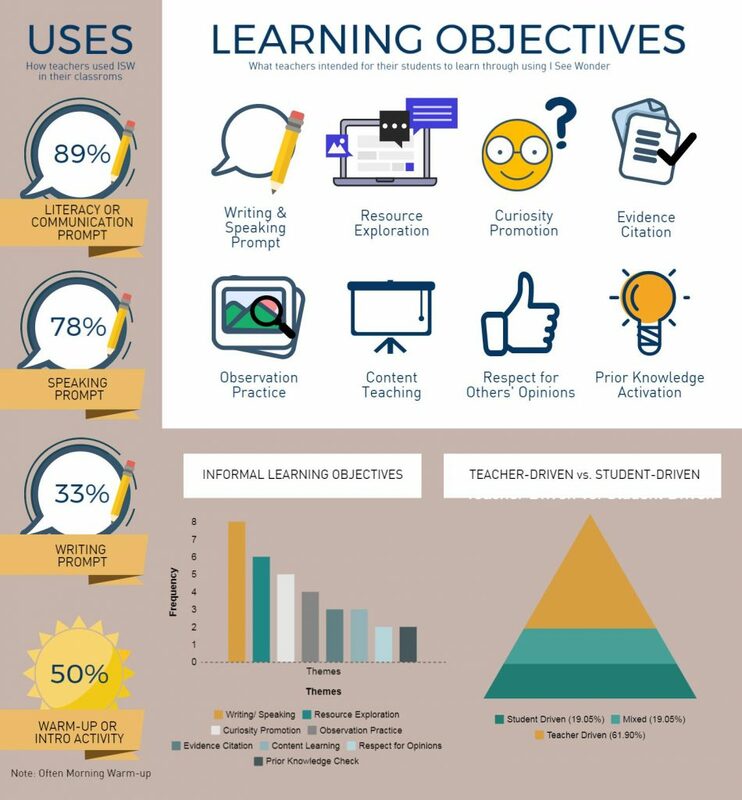 While the written report summarized the findings in a detailed fashion, I decided on creating a condensed infographic report with data visualizations to encourage quick and easy future reference, and for use during the presentation at the Board meeting. I’m happy to report that Sara and the Education committee received it well. During these past six weeks, I was able to apply what I had learned in my Learning Design and Technology graduate courses, and I also gained realizations about the evaluation process in regards to the importance of a plan, consistency, and presentation. Thank you to Sara, Erin, the other interns, and the Libraries’ staff that supported my efforts.